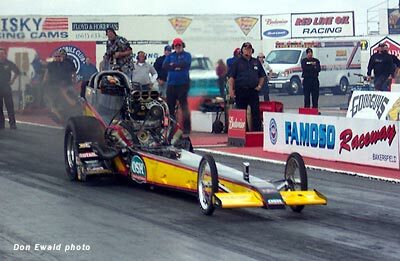 At the end of the 2002 season, Jim Murphy and the OSH-WW2 Racing team had one goal - to regain the VRA Top Fuel Championship in 2003. 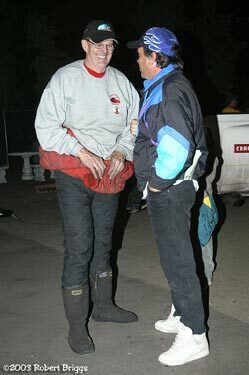 From the opening event in March, said championship was a two horse race ... Murphy and the always tough Jack "The Sheriff" Harris. And as it should be, the title came down to the wire at the final event of the season. 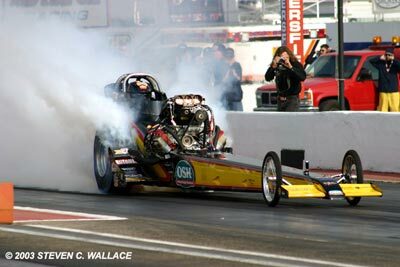 Coming into the 5th Annual Fuel & Gas Finals, Harris had a slight 8 point lead (less than one round of racing). 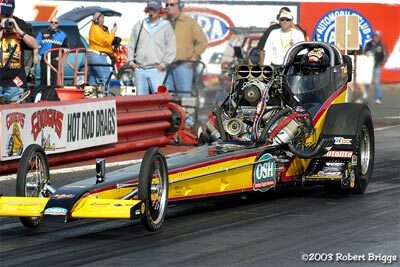 The bottom line was whoever went one round further in eliminations would be the 2003 Top Fuel Champion. 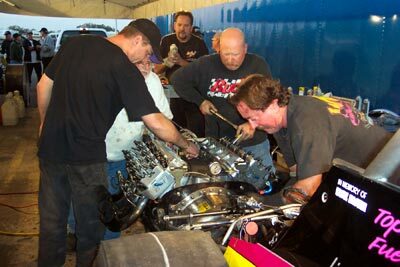 From Saturday morning the drama was palpable throughout the pits of Famoso Raceway. Amid the smiling and joking, the underlying anticipation and tension between the Murphy and Harris camps could be cut with a knife. For the fans it added a dimension seldom seen at any race. What fun! In a scenario beyond the mind of a Hollywood screen writer, the weekend played out with twists and turns earning it the nickname, "Groundhog Day." 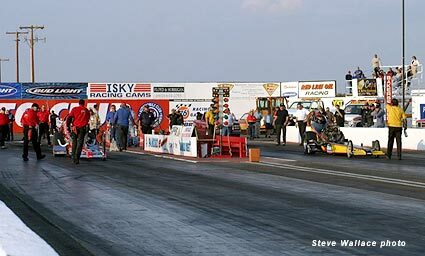 Amid world records and very close racing, the actual championship was not decided until the semi final round of eliminations on Sunday. And that story would be better told in the photos below. 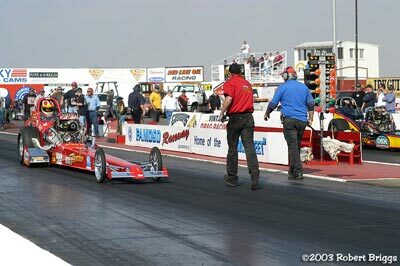 After a heavy rain storm on Friday and with temperatures in the mid 60s, the track surface was suspect going into the first session of qualifying. Most teams "de-tuned" for the conditions and as a rule, that was a good call. 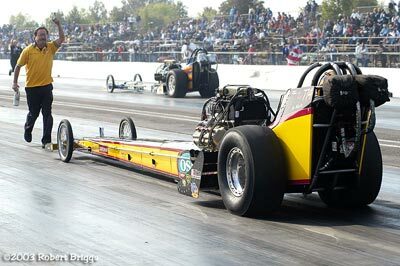 The "groove" was narrow and only four cars ran in the 5s - the rest were all over the board. 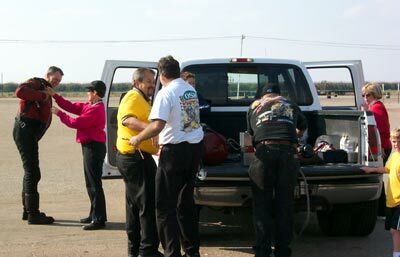 This year the VRA Finals hosted a 16 car field so the OSH-WW2 Racing crew wasn't worried about making the field, but they did want to qualify at or near the top. 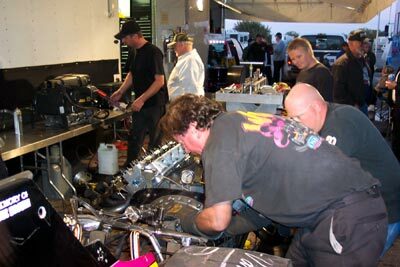 With only two qualifying sessions offered (both on Saturday) crew chief Tim Beebe approached the first session with conservative and proven tune-up. 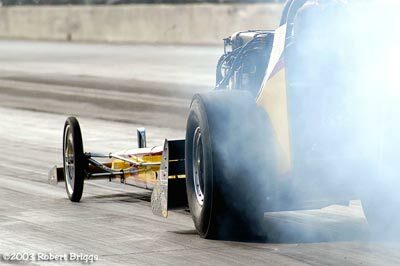 Barry Byrne backs Murphy up after the burnout. The overcast skies are obvious in the photos. 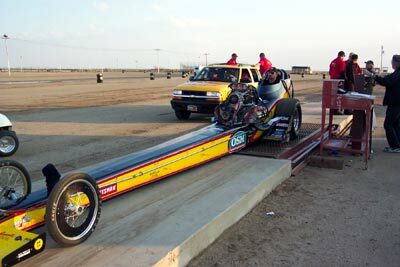 In spite of a somewhat "mild" tune up, the first run yielded a 5.920 @ 237.96. This would be good for the # 3 spot after the first session. 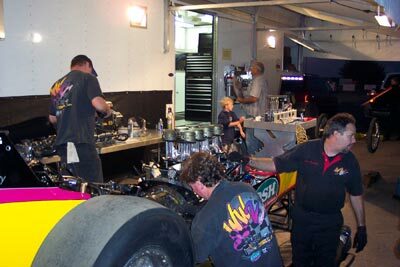 Between sessions the order of business was to keep warm and put some more horsepower into the engine. 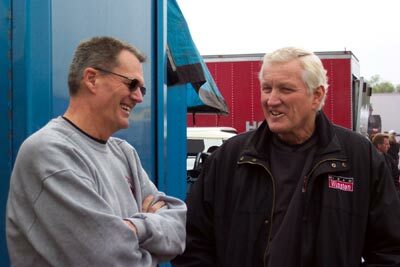 Jim Murphy takes some time to visit with old pal John Rodek (who makes the TFX cylinder blocks used by Murphy and several others). Later in the day the sun was sneaking through and the track was considerably better. 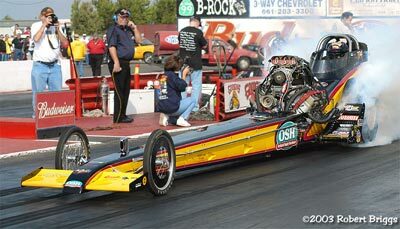 Even though the tires were smoking in the lights, Murphy netted a stout 5.831 at just 231.89. 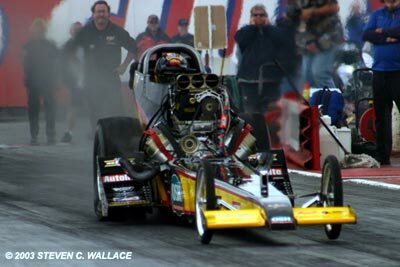 This was good for the # 1 qualifying spot going into eliminations. Following the final session the car was gone over from front to rear in preparation for first round on Sunday. 10AM Sunday morning and first round is under way. 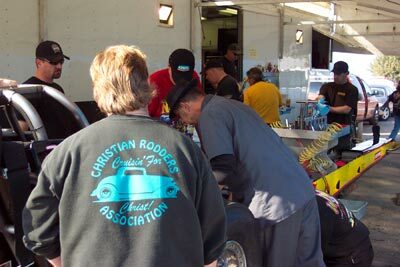 The temps were still in the 60s but there was enough sun to make for great racing weather. 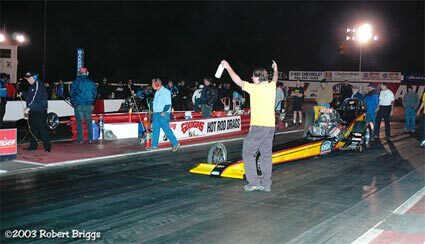 Any racer will tell you that the first round of eliminations is always the toughest on your psyche. Anything can happen and often does. You can never take your opponent lightly. On this day Murphy would meet Brendan Murry in the opening stanza and nerves were razor sharp. 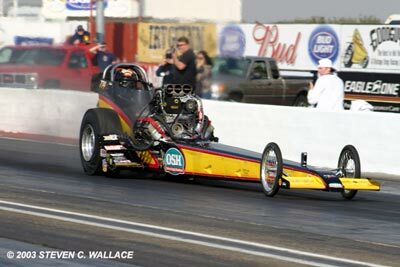 Picking up where they left off, the OSH-WW2 Racing entry won easily with a 5.864 @ 245.63. 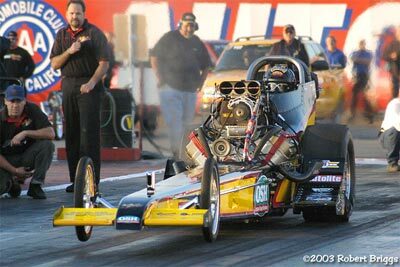 The MPH was up as the top end tire spin was down. 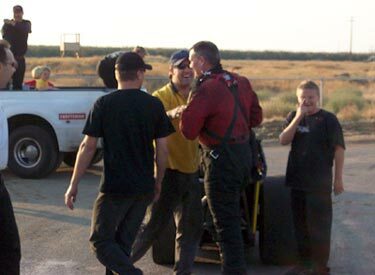 Round Two - In this round Murphy was due to meet Bob Muravez and was breathing easy as the championship race was over. Or so they thought. 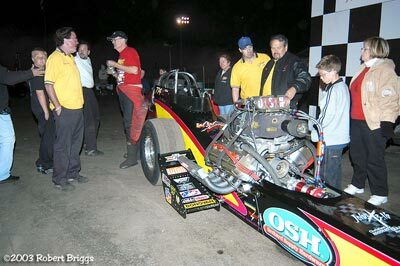 In a piece of racing luck, Jack Harris got back in under the break rule. Muravez blackened the crank in the first round win and couldn't make the call. 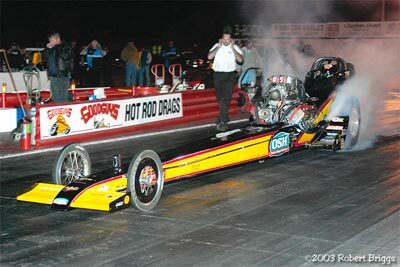 Now all bets were off and this race would decide who will win the Goodguys Top Fuel title. 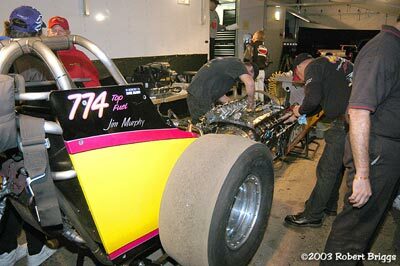 Jim gets ready for battle. 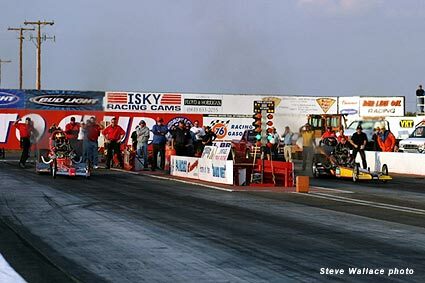 After their respective burnouts, both cars methodically backed up to the starting line. Harris took a small lead at the green and held it most of the way down. 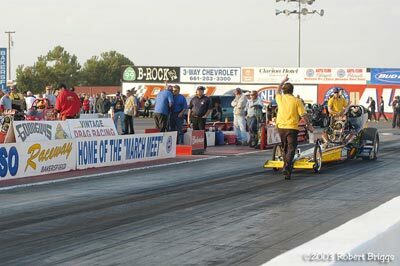 Murphy got the lead back and squeaked out a win and the title (so they thought - again) with a 5.897 @ 220.37 to Harris' stout 5.933 @ 253.02. 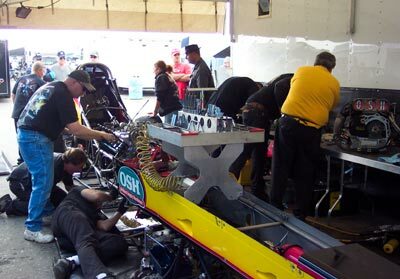 Between rounds the OSH-WW2 Racing pit was a nonstop thrash to make sure the car was perfect for the next race. Groundhog Day - take two. The event had turned into a two out of three match between Murphy and Harris. 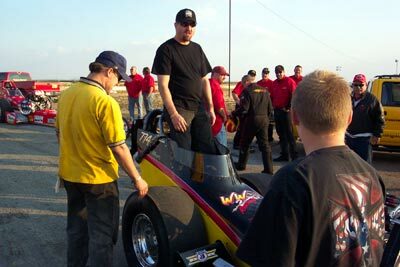 Like dirt, the Nitro Thunder team was everywhere and would not go away. Being the low ET loser from round two, Harris got back in on the break rule - again - when Kent Terry failed to make the call. 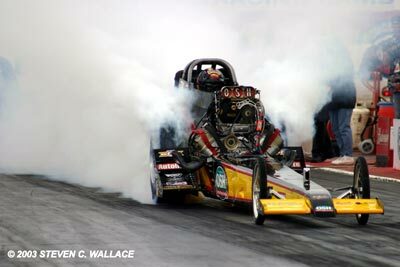 Murphy heats his tires in the haze of Harris' burnout. For the second time in as many hours Murphy and Harris back toward the starting line. Same lanes - same everything. Harris gets another slight lead at the hit but it's Murphy that pulls out the astounding 5.734 (first leg on a new national record) to take the win. 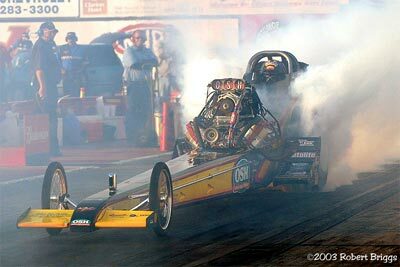 Harris goes into uncharted territory with a 259 mph pass (fastest in history) in the other lane. For Murphy the margin of victory = 0.024 seconds (approximately 9 feet). And finally the championship was his! 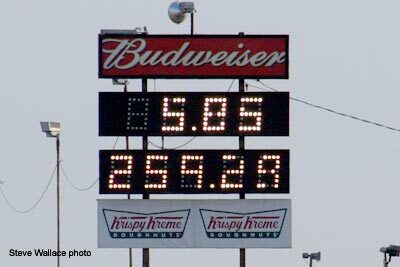 Murphy's scoreboard - the quickest time in history. His comment, "I think going 5.73 kind of surprised me. That's a pretty big jump. 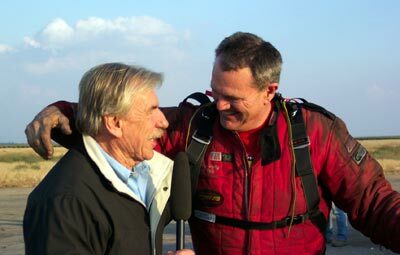 Everything is always so close, so to make those kind of jumps is kind of unusual." 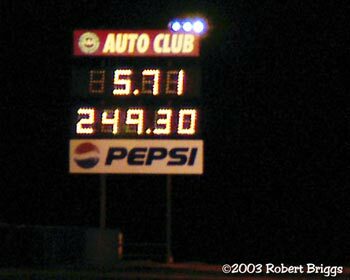 Harris scoreboard - the fastest run in history. 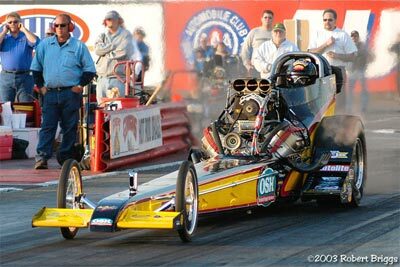 Together this added up to the quickest and fastest Nostalgia Top Fuel race ever! Now, if you are not duly impressed by these numbers I would ask you to go get a garden variety 12" ruler and hold it in front of you. The width of this ruler is all the tire that's on the ground when these cars are racing. I think the point is made. 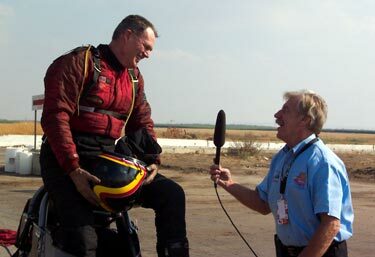 Before he was even out of the car, Murphy was being interviewed by Jim MacMonagle for 1010TV. 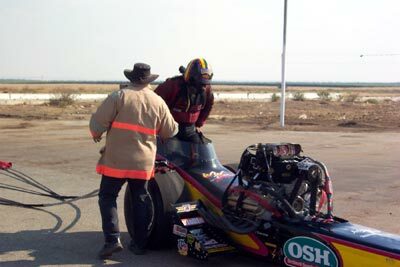 Needless to say, the crew was ecstatic as they arrived to pick up the car on the top end. Plenty of high fives to go around but there was still an event to win. 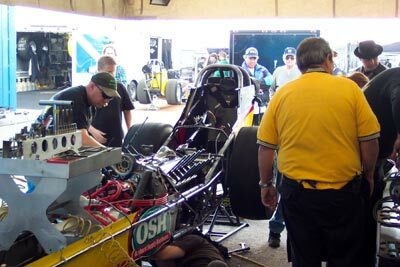 It was back to the pits to prepare for the final. 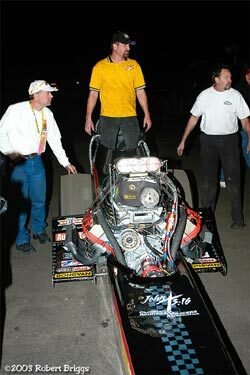 After every win (especially when a national record is at steak), the car and driver are weighed to make sure they are legal. No problem here. 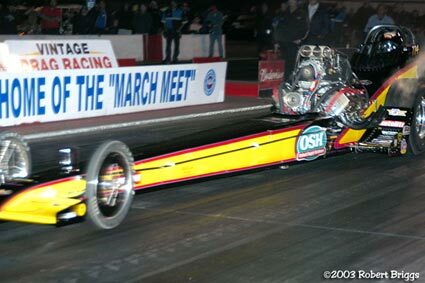 As darkness fell, the OSH-WW2 Racing fueler could be found in the same lane they'd run all day. 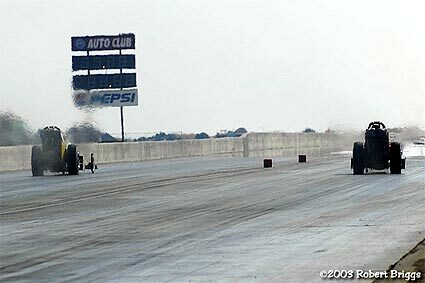 The difference was that Jack Harris wasn't in the other lane (as well he could have been had the Fuller & Dunlap team not repaired a blown engine from the semis). 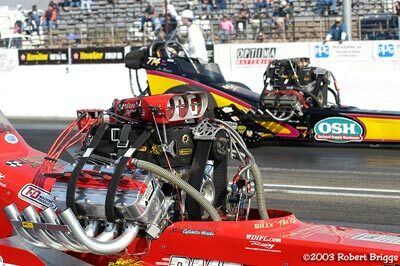 Sporting a brand new set of rear tires borrowed from Bryan VanDyke, Murphy was ready. 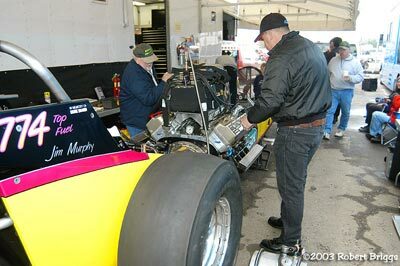 For the finals Murphy would meet Bill Dunlap in Mike Fullers's potent "stealth car". 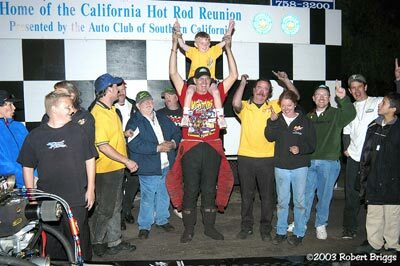 After the burnouts Murphy was back first. 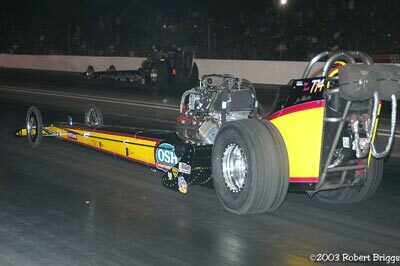 After what had transpired earlier, the only thing left for the OSH car to do was to win the event. 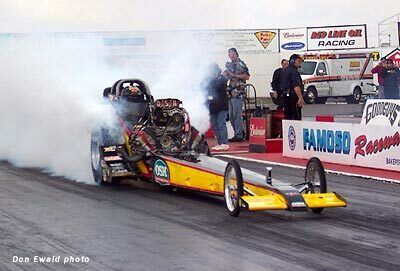 The car was tuned to run another 5.7 and if the tires didn't smoke, it would. 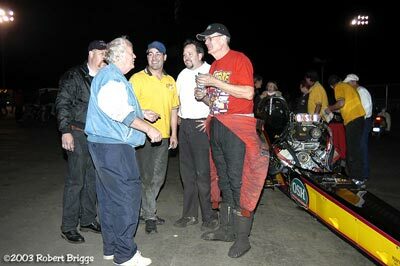 Barry indicates to Jim the distance left for him to stage the car (put the front wheels into the light beam). This race was never in question. 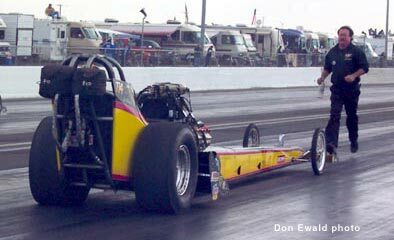 Murphy left first by two tenths and the car was off like a rocket. 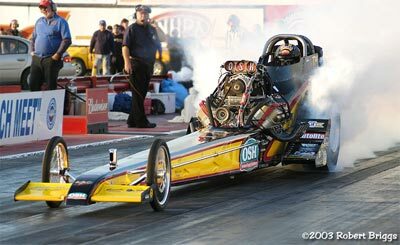 5.71 seconds later there was another new VRA record ET for Murphy as his earlier 5.734 against Harris in the semis backed this ET. 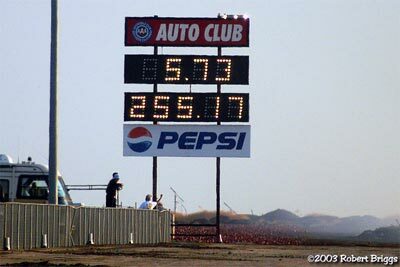 There's no telling how good the run would have been if Murphy hadn't literally run out of fuel at the 1050 foot mark. 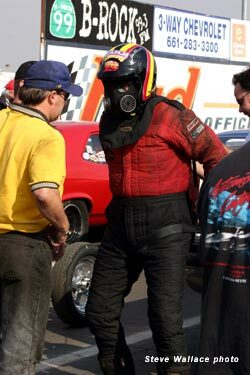 Dunlap had trouble from the start when his goggles came unsnapped and he had trouble seeing the staging lights. 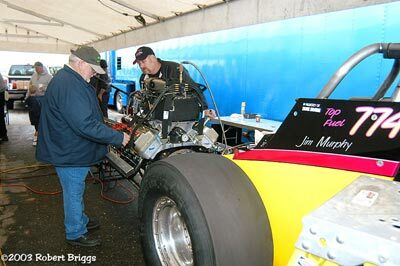 He also had engine problems and shut off very early with a 7.39 @ 116. After the fact - it was time to celebrate! Murphy summed it up in his own words, "I don't know what else we could do better than what we did today. We got the (elapsed time) record by over a tenth and a half second, which is like unbelievable. 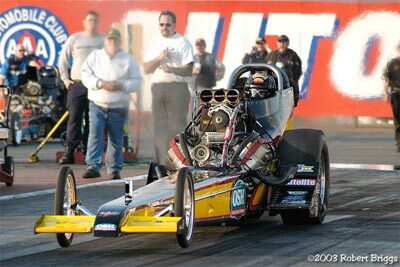 I mean that just doesn't happen in any class in drag racing. 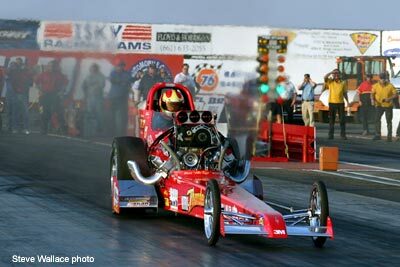 Then we ended up getting the VRA Top Fuel Championship and winning the race ... all kinds of good stuff." Good stuff indeed. 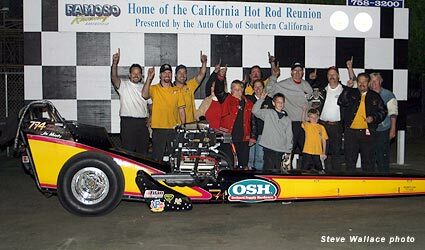 Now the OSH-WW2 Racing crew can savor all this for the winter and then gear up in 2004 to defend the championship they now own for the unprecedented 4th time.